Our horses are incredibly friendly and love meeting people. If you’d like to come and see them at the stables just get in touch to arrange a visit. Alternatively, our horses will happily come to your community or school event. Ned came to us in 2014 with his own ideas about how we should run the yard! He’d like to be fed every hour and will happily kick his door when he runs out of hay or haylage. He’s very brave with training and takes it all in his stride, but likes to play too, keeping his handler on their toes. It’s safe to say that Ned likes to do things on his terms and isn’t worried about being gentle with the other horses when it comes to grooming and scratching. Beau came to us from Wales a year ago and has taken to his new role perfectly. He’s very laid back and when he isn’t out on patrol, prefers to spend most of his time sleeping. He’s everyone’s friend and loves to be cuddled when out in the community or at visits. But strangely, he doesn’t like puddles and will always try to jump over them. What he lacks in experience, he absolutely makes up for in his ability and motivation to do his job well. We’ve had the pleasure of working with Arnie for three years now after he came to us from the Wirral. He’s a lively horse, squeaking with excitement during training and when he’s out on patrol, and always checking pockets for more mints. He loves being fussed and is a favourite amongst our officers to ride in the school for training. But he loves Harriet even more! When she’s out on patrol, he waits for her and whinnies when he hears the wagon turning into Greenhill Road because he knows she’s nearly back. Pheobe might be the smallest of the bunch, but her safe and steady character when out on patrol makes her a fantastic police horse. She’s been with us since 2014 and gets on brilliantly with the other horses, in fact she likes to sleep and share her haylage with Elvis every night. In the riding arena she’s very lively and loves showing off her jumping. Jake has been with us since August 2004 and so is one of our longest serving police horses. He certainly doesn’t act his age though, bouncing between the fences and training the new recruits on their courses. He’s an excellent and brave police horse and has represented the Force in countless events, including the 2011 Disorder. In the yard he likes to sleep and have breakfast in bed with a cup of tea. What he doesn’t like is having his fur trimmed, and will kick up a fuss when it’s time to be done. He’s also the fastest at undoing his rope if he thinks you haven’t tied it up properly. Elvis is our tallest horse and has been with us since he came over from Ireland in October 2008. Maybe because of his impressive height, he likes to boss the other horses around. He’s helped teach every new recruit we’ve had and can complete jumps so big in training, we’re sure he thinks he’s trying out for the Grand National. One of his proudest moments was representing the force at the London 2012 Olympic Games. He loves a fuss and really dislikes the vet, giving him a hard time every time he comes to visit. One of the oldest in the department with the biggest feet in the yard. Since 2004, Major has represented the department in every event. 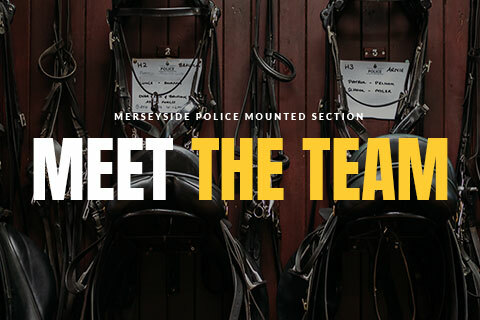 He was part of the Disorder in 2011, has lead the winner in at Aintree, policed numerous football matches, lead the team coach through the city when Liverpool won the cup, and represented the force at the London 2012 Olympic Games. He looks exceptional at ceremonial events and can hold up traffic to do a wee so long it goes through 2 cycles of lights. He is everything a police horse should be: big, brave, imposing and within a flash as sweet to anyone who visits or he meets out on patrol. On loan to the force, Daisy is our newest recruit. She takes everything in her stride, she loves Major and observing everything he does, and is now fully operational after a short period of time in training. Daisy also loves Harriet. Silver looks grey now he’s older, but underneath his grey coat his skin is two tone. With us since 2012, he’s the resident Diva, liking everything his way. Still, he is an exceptional police horse and takes everything in his stride, plus he’s an excellent leader taking in the LFC Team coach alone at Anfield. He leads the winner in on the Grand National most years and has attended numerous events during his career. He was born to be a Police Horse. He loves the fuss and is convinced everyone is cheering for him. Willow has been on loan to the force since Jan 2006, and was one of our very first mares. She is a pretty, finer built horse and is really good at her job. She is very protective over her food and won’t share. Willow has represented the force in numerous events including the Disorder in 2011, and she was the lead horse in the musical display ride and would change her pace to suit the music. She is a real hard worker that keeps everyone in check. Boo has been with us since 2007 and is one of the kindest horses, winning Police Horse of the Year two consecutive years running. He has represented us on mutual aid to help out other forces and has done numerous events throughout the force, including the 2012 London Olympic Games. He is a really warm horse and at any given opportunity can be seen trying to pull his rugs over his head so he can stand with no rugs on. He loves to groom the other horses and is very sociable. He has taught many of our new recruits to ride. Harriet has been with us since 2005. She spends any moment she isn’t working sleeping and loves a good lie in. She is our other ceremonial duty horse and looks amazing when she is dressed to do her duties. She likes to slobber all over people at events so we have to try and keep treats to a minimum. She looks after the new recruits on the courses and is the patrol horse for all the new riders when they first go out. She has led the winner in on so many occasions, she now thinks that’s her job over the Aintree weekend. She loves the fuss and also thinks all the cheering is for her. Boris has been with us since 2007. Boris has led the winner in at the National and appeared at all events across the force. He is a lovable character and like the others, believes any cheering at any event is for him. He was part of the team during the Disorder in 2011 and represented the force at the 2012 Olympic Games. He trains new recruits and takes them out on the first patrol. He helps train the new horses and loves his food and chilling out. Boris loves scratching with the other horses and is quite sociable.